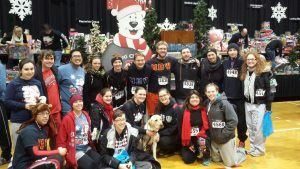 December 8th, 2013 – The Big Chill 5k Run! This past week, the Brothers of the Pi chapter of Mu Beta Psi ran the 11th annual Big Chill 5k. The Big Chill 5k is a unique charitable event. There is neither a registration fee nor a requirement to raise funds. Instead participants are asked to bring a new toy for a child between the ages of 3 and 14. This year, about 8,300 people registered and over 9,000 toys were donated. Next year will be even bigger and better, and the Brothers will be sure to be apart of it! May 1st, 2013 – Congratulations to our Graduating Seniors! 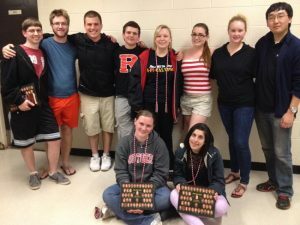 Pi chapter has 11 seniors graduating this year. We wish them the best in their future endeavors! April 14, 2013 – Pi chapter welcomes 13 new Brothers, the Alpha Upsilon Pledge Class! The Alpha Upsilon pledge class includes thirteen members. Top: Julie Manock, Eduardo Bruno, Cyrus Heidary, Kieran Walsh, Becky Hill, Kristen Stanton, Jason Petti. Bottom: Jake McDonnell, Caitlin Kober, An Le, Rachel Uhrig, Susan Zane, Devonne Jones. March 23, 2013 – APICALYPSE in New Jersey: Convention 2013! 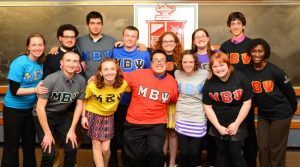 Mu Beta Psi’s national convention this year was held on the banks of the old Raritan at Rutgers University. 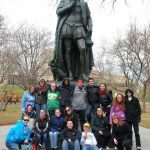 Over the weekend a number of activites took place on college ave, and the event ended with a banquet at the Cook Campus Center. Over 150 Brothers from all over the country came for the event, and it was a spectacular time. Thank you to everyone who came, can’t wait to see you all at Rho-con in 2014! The third annual Snow Ball was held on this lovely Friday evening while actual snow was falling outside. 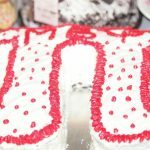 The night contained music, dancing, food, pictures, and raffled off prizes. Over 100 people attended and the event went off without a hitch. All the Brothers were very happy with how the event ended, and in the end raised about $3000 dollars for Union Beach Memorial School. A special thanks goes out to Jesse Nietzer for his photography and Nick Blew for the music. Thank you to all who attended and we hope you all had as magical a night that we did. Hope to see everyone at the next Snow Ball!